The Bloody Mary is a tough old bird, a real battle-axe of a mixed drink. A proud warrior worthy of her name, armed for rescue after a big night out. We are going to set you right, she says. I’ve got salt, I’ve got heat, and I’ve got the ol’ hair of the dog. Let’s get this done. The extent of the Bloody Mary’s curative powers might be up for debate (I spend every Saturday night at the library, so I just wouldn’t know), but what’s more or less universally agreed upon, once you get past the idea of having a glorified gazpacho for a cocktail, is how tasty the dang things are. My dad makes the definitive version, as I see it: clear-your-sinuses spiciness from horseradish, black pepper and Tabasco. The fortifying tang of tomato juice and a darkly savory splash from that wonder condiment, Worcestershire. It’s a real kick in the pants, his Bloody Mary. Unfortunately, my father lives on the other side of the country. Bartenders often disappoint. My resident mixologist/husband doesn’t care for them. I had to take matters into my own hands, then: in the name of brunch and self-sufficiency and Vitamin C, I would figure out how to make a proper Bloody Mary myself. It took my friend Kate and I the better part of a World Cup match to get this recipe down pat (a corollary of my sports-related attention span), but I think we finally nailed it. It’s about as close as I can get to Dad’s version, though Miss Kate and I did err on the side of a less boozy Bloody, medium spicy. Doctor it the way you like them, of course, but hopefully you’ll find our recipe serves as a mighty fine template. Now, a word about garnish. I’ve seen whole salads of pickled produce go into the drink, skewers of olives and onions and caperberries and whatnot. (In a bit of synchronicity, the Times food section recently reported on the garnish craze that’s taking official Bloody Mary circles by storm. It’s cornichon mania!) I’m usually more of a celery stick traditionalist, but yeah, why not glam Mary up with homemade pickled green beans? She deserves it, the old girl. 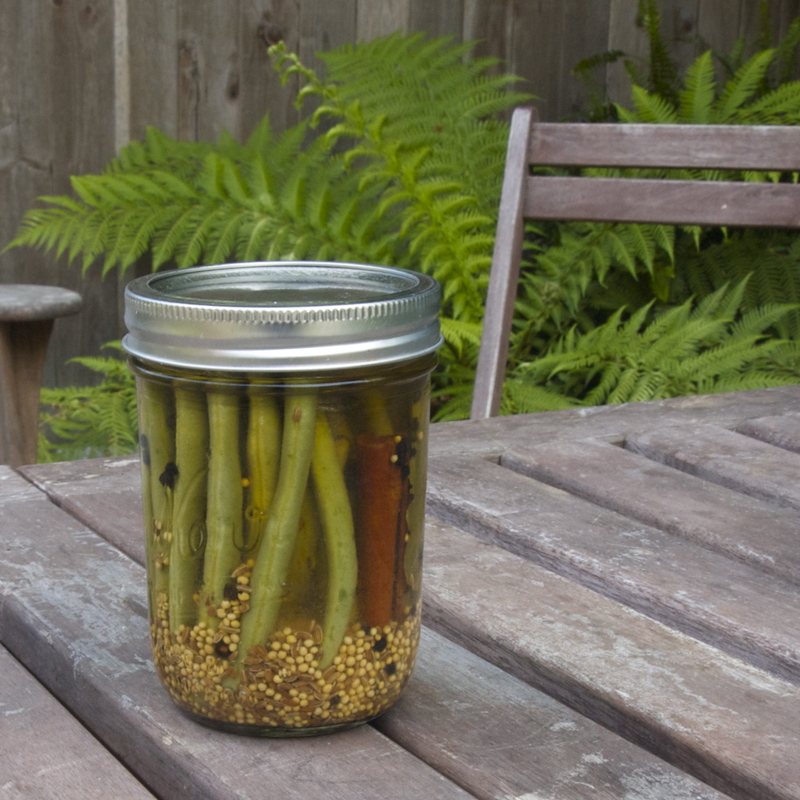 The pickled beans come out crisp and delightfully tart and briny, a knockout swizzle stick for your just-how-you-like-it Bloody Mary. And thanks to the brine’s high acidity, the beans will keep for several weeks in the fridge. In case, you know, you have another late night out at the library. In a cocktail shaker, mix the first six ingredients to make a slurry. Add vodka and ice. Add tomato juice and shake to combine. Pour over ice (don’t strain it) into a celery salt-rimmed rocks glass and garnish with pickled green beans or a celery stick. Wash and trim the ends off the green beans. Discard any bruised beans. In a clean canning jar, place the dry ingredients. Turn the jar to the side and stack the green beans, trimming any to fit, if needed. Fill the jar halfway with white vinegar. Top off with water to cover the beans. Seal the lid and shake gently to distribute the ingredients. Refrigerate three days to let the brine do its thing. Beans will keep for a few weeks in the fridge. 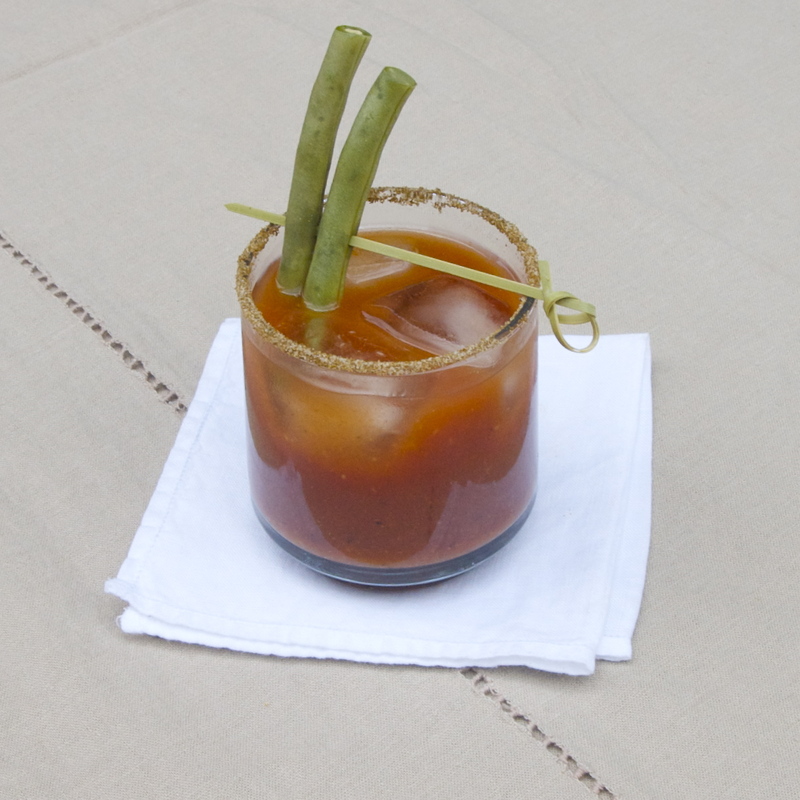 This entry was posted in Recipes and tagged Bloody Mary, brunch, brunch cocktails, cocktail, easy pickle recipe, green beans, horseradish, pickled green beans, refrigerator pickles, spicy, tomato juice, vodka. Bookmark the permalink. Inspiring! Note to self: avoid using low sodium V8 in the construction of this drink. Pingback: Massachusetts Food Trader | Pickled Green Bean Bloody Marys!